Rod Abrams Funeral Home Ltd. Barbarajean James - Rod Abrams Funeral Home Ltd. The family will receive friends at The Church of the Evangelists, 99 Queen St N, Tottenham, ON, L0G 1W0 on Sunday January 27th, 2019 from 1:30 pm until time of Memorial Service at 2:30 pm. Sunday January 27th, 2019 at 2:30 pm. Peacefully, at Matthews House Hospice, Alliston, on Wednesday January 23rd, 2019. 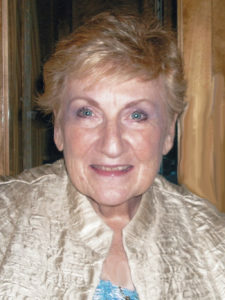 Barbarajean (Batty), in her 81st year, beloved wife of David James. Sadly missed by her brothers and sisters-in-law Tony (Molly), Keith (Betty), Monica (Klaus) Windmuller, Rosemary (Mike) Naemsch and the late Gus (Barb) and Gloria. Fondly remembered by her many nieces and nephews. Our prayers are with you David and family. Barbarajean loved Sasha, did take him for walks even when it got soooo difficult. She had a great spirit! David so sorry for your loss. We so enjoyed Barbara Jeans sense of Humor and her replacement of our magazines. My thoughts are with you at this difficult time. Dave please accept my most sincerest condolences. My thoughts and prayers are with you during this difficult time. Hugs. I did not have the pleasure of knowing Barbara Jean, but I did know of your devotion and love for her. Dave, please accept my sincere condolences. My thoughts are with you at this time. We are so saddened by your loss. Your dear wife’s cheerful smiles and greetings were a source of joy to all in the community. Your example of compassion & devotion to Barbarajean is surely one to emulate and will be fondly remembered. Oh Dave, I ‘m so sorry to read this. She was such a kind lady with a great sense of humour the few times I met her. Thinking of you. Hugs! So many happy memories of time spent with Barbarajean and you. I felt so sad and then some memories of some of our shenanigans came and it brought such a smile to my face. She will be missed.